A renegade British bishop was fined 10,000 euros (£8,750) on Friday for denying the Holocaust in a case that has acutely embarrassed the Vatican. The case went ahead in a German court without Richard Williamson, whose breakaway Catholic fraternity told him not to testify, his lawyer said. Denying that the Holocaust took place, or questioning key elements, is illegal in Germany. The bishop acknowledged the offending comments in a statement read in court. Williamson, 70, was convicted by the court in the southern German city of Regensburg of inciting racial hatred for stating in a TV interview aired in January 2009 that only "200,000 to 300,000 Jews perished in Nazi concentration camps". He also denied the Nazis had used gas chambers. Imposing the fine in the high-profile proceedings on Friday, presiding judge Karin Frahm said: "The statements by the accused represent a denial of the actions taken under the National Socialist regime. "Bishop Williamson must have assumed that his remarks would draw attention. Williamson knowingly accepted that attention." Williamson was fined 12,000 euros (£12,500) earlier this year for giving the interview in Germany to a Swedish broadcaster. The latest trial was ordered after Mr Williamson, who lives in London, refused to pay. He faced a sentence ranging from a fine to up to five years in prison. Williamson's lawyer, Matthias Lossmann told the court: "Bishop Williamson would gladly have come, but the Saint Pius X Society suggested he did not - to be precise, they forbade him from coming." The court on Friday heard an excerpt of the interview, in which Williamson is heard telling the interviewer: "Be careful, this is against the law in Germany." 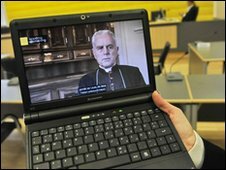 The bishop was told the interview would be aired only in Sweden, Mr Lossmann told the court. He said Williamson could not be held criminally responsible for its release in Germany. "That will be the crux of the case here," he said. "We do not even need to discuss the fact that these remarks are unacceptable, that is completely beside the point." Mr Lossmann read a statement by Williamson in which the cleric acknowledged casting doubt on the Holocaust. "I was aware that it is against German law to express such doubts, so I expressed these doubts for exclusive broadcast on Swedish television" where such remarks are legal, he said. The Saint Pius X Society, an ultra-conservative, Swiss-based Catholic fraternity, appointed Williamson a bishop without the pope's blessing after it broke away from Rome over the Vatican II reforms of 1965. Among the reforms rejected by the organisation was a declaration, Nostra Aetate, which states that "God holds the Jews most dear"; condemns any form of anti-Semitism; and specifically repudiates the idea that the Jews as a whole should be held responsible for killing Jesus Christ. The trial comes at a difficult time for Pope Benedict XVI and the Vatican as a sexual abuse scandal rocks the Catholic church. Hundreds of people have come forward in Germany and other countries around the world, saying they were molested by predatory priests. Bishop Williamson's case prompted a rare comment on religious matters by the German chancellor. Angela Merkel called on Pope Benedict to "clarify unambiguously that there can be no denial" that the Nazis killed six million Jews. Williamson has said he wished to apologise to anyone offended by his comments but has refused to retract his assertions, saying only that he would re-examine the historical evidence. But the Vatican immediately rejected the apology and told him to "unequivocally and publicly" withdraw his remarks. Although this story took place on Friday, 16 April 2010, it was updated on Wednesday, 21 April to clarify the changes made by the Vatican's Nostra Aetate declaration.